The Marvel Cinematic Universe has recently surpassed ten years of films and TV shows, but that isn’t slowing the house of ideas and their ever expanding list of projects and superhero adaptations. Fans may have had some bad news lately regarding the cancellation of many of Netflix’s Marvel properties, but true believers still have plenty of Marvel television to enjoy as we move into 2019. For some time Cloak & Dagger has been said to be one of the most connected MCU TV shows, finding links to both the films and other shows, including Netflix’s Luke Cage. On the other hand, Runaways has seemed very self contained so far, with only a few connections to a wider world, such as the magical link to Doctor Strange. However, it seems that these links to a wider cinematic universe could be about to get a lot stronger, as – after years of clamouring for significant Marvel Television crossovers – we may finally be about to see just that. Posted from the official Cloak & Dagger Twitter account, stars Aubrey Omari and Gregg Sulkin (Cloak & Dagger’s Cloak and Runaways’ Chase respectively), can be seen together teasing “a very special shoot”. Nothing to see here. Just a couple of super heroes. Whilst it is easy to get excited about the potential for an episode that brings Cloak & Dagger and Runaways together, it’s worth noting that the word “shoot” is used specifically here and the equipment in the background suggests that this is a photo shoot rather than any kind of crossover episode. 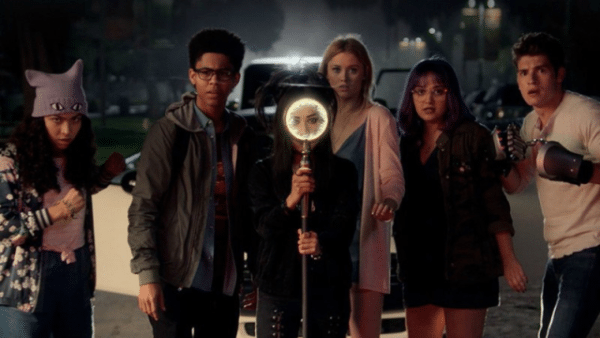 I think that Runaways and Cloak and Dagger are actually quite similar as in the style of the shows. However, as much as I would love for there to be a crossover, I’m not sure if it will happen. The main reason being that the Runaways are based in LA while Cloak and Dagger are in New Orleans. So, how can they even possibly meet? But, there was a crossover in the comic books, so hopefully there might be something to expect from the TV shows.